On Oa Larfleez the orange lantern and sayd his personal guardian tries to save the rainbow corps from certain death at the hands of the Guardians of the universe. They manage to create enough of a distraction for everyone to gather themselves. Ganthet tries to kill Sayd but Kyle Rayner intervenes saving her. Ganthet pleads with Kyle to hand himself over to the Guardians now that he has seemingly absorbed all the powers of the multicoloured rings he wielded last issue. 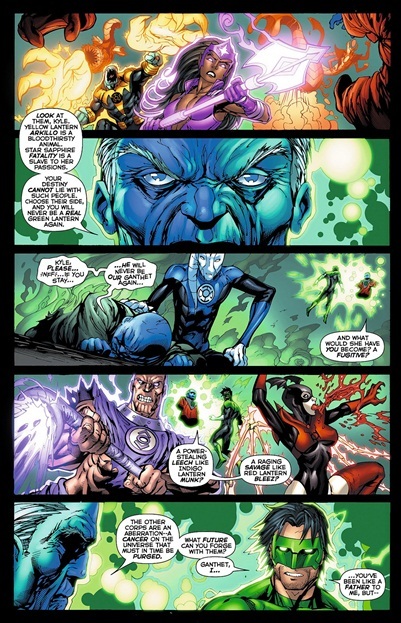 Kyle can’t bear the new emotionless ganthet and has the purple lantern teleport them to Okkara, the orange lantern base. There Arkillo has his severed tongue healed by the blue lantern. Sayd then reveals the cause of Kyle’s powers a newly massive vessel berthed from a white hole with startling powers within. Cover- By interior artist Tyler Kirkham, it shows the rainbow corps fighting orange lantern Larfleez, very pleasing cover. Mystery- The mystery of why Kyle was chosen to wield the emotional spectrum in its entirety continues. Each new piece of the puzzle leaves more questions to be answered; Tony Bedward has my undivided full attention. Art-Tyler Kirkham continues to showcase his undiluted talent in this book with a style perfectly suited for Kyle Rayner. The gorgeous and dynamic colors only add to the rich tapestry of art, I love it! Kyle and Ganthet- Man! I feel deeply saddened by Ganthet losing his emotions; I feel the pain of Kyle and Sayd seeing my favourite lil blue man a pale shell of his former glory. This rendition of Ganthet cuts me to the core and gives support to massacring the entire lot of Guardians in retribution for the callus and evil act. Kyle likens Ganthet to a father which make’s it all the more painful to watch them pitted against each other. Tony Bedward clearly has a deep understanding of who kyle is and what makes him tick! Fatality- Gorgeous and stunningly illustrated+ they remembered to give her the correct elflike ears. 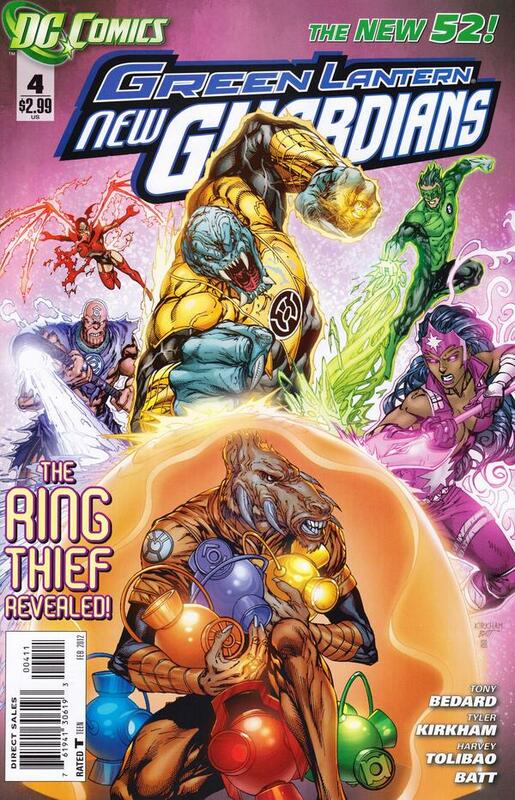 I don’t read all the new 52’s and i don’t know if the stories continue in the other books to keep pace, but when i got the first Green Lantern: New Guardians book Kyle just got his ring and in the second book, the way it flows you would think that he was a gaurdian forever, and that you missed something in between 1 and 2.